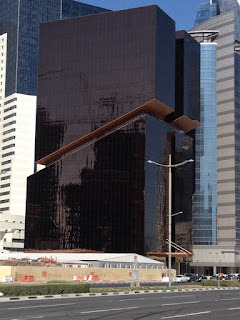 Binge Thinking: Doha Diaries: Days 66-70, An Apartment, The "Perfect" Margarita, and The Fearsome Minoryx! 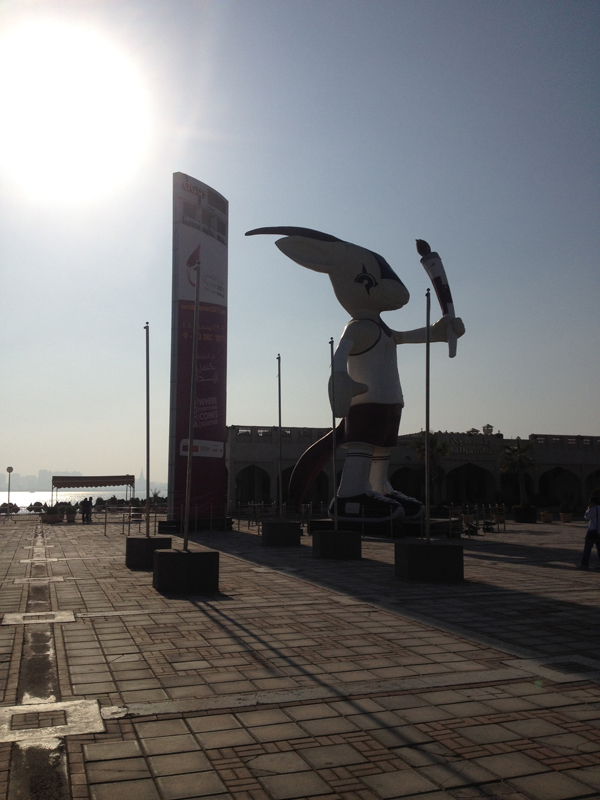 Doha Diaries: Days 66-70, An Apartment, The "Perfect" Margarita, and The Fearsome Minoryx! I hopped on the rowing machine again today and managed to push up my distance a bit, but, for the most part, about the same as my last time. I walked to and from work today, and en route, snapped a picture of another interesting-looking building. I finally moved into one of the corporate apartments that my company has at the Al Rabban tower today. Here is a very poor quality video of the experience. My primary motivation for moving in was because of the wasted money paying for a hotel. 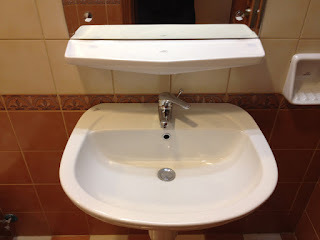 If you recall from my prior blog post, Doha Diaries: Days 23-28 , Exercise, Apartments, Turkey, Orchestra!, I had reservations about moving into this place primarily because of the gym facilities. Well, now that I only have four weeks left before my assignment ends, so if my routine has to be dialed down to "maintenance", I think that is manageable. Breakfast food - Oh how I wish there was a diner, Denny's, IHOP, etc. nearby. Some immediate observations about the apartment. 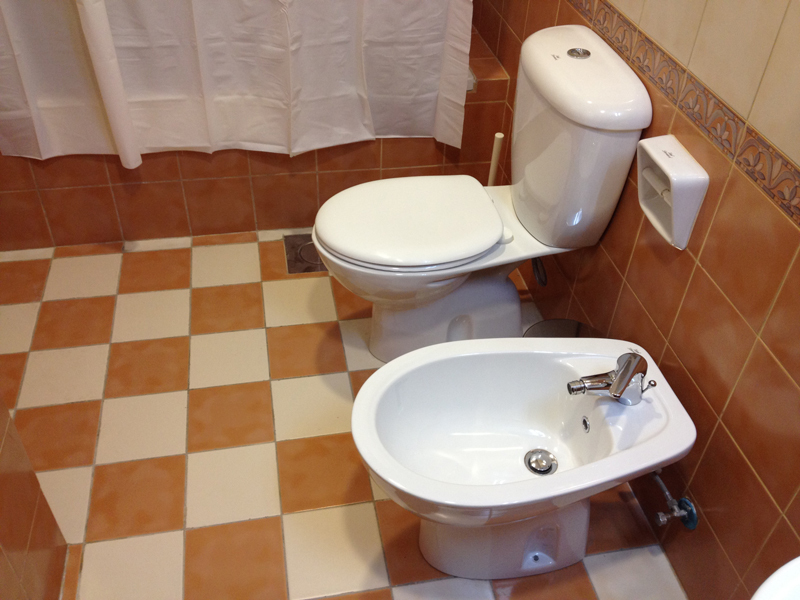 Aside from the bidet in two of the three bathrooms, which seems to be the norm here for well-appointed bathrooms (you probably don't want to see a picture of the ones where you squat and use a hose afterwards). 1. Virtually no bathroom storage space - the ledge you see in above the sink. That's it; in every bathroom. No counters. No cupboards. My toiletries pretty much spill over the edges; oh well, I will have to be careful. 2. Wifi only exists in the living room - because of the thick (concrete?) walls and the router being located in the living room, that is where you will get wifi, period. Do NOT expect to get it anywhere else. 3. Only the living room and master bedroom can have internet access, and the living room only has a cable port so 1) provide a long cable if you want to use the office desk to work and 2) provide your own wifi router if you want wifi. 4. 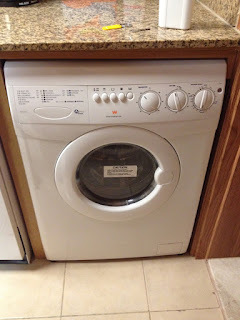 Funky washer/dryer combo...with no manual...I have this I Love Lucy scene in my head with me slipping and sliding on a sea of soap bubbles pouring out of my washer...manual requested. 5. TINY closets. I am not kidding here. Half of the closest are shelf/drawer space. So, you actually end up with about the same closet space as a hotel, maybe even slightly less. 6. SHALLOW closets. The doors rub significantly against your hanging clothes when you open and close them. In fact, you have to be careful where you hang your suits, lest your sleeves get mashed in the door when it closes. 8. The regular spatula is stainless steel, but the skillet is a non-stick surface...this will not end well for the skillet. 9. You can faintly hear the "call to prayer" through the windows...hopefully the early morning ones will not wake me up...if you are not familiar with this, here is a sample of the times that the interwebs tells me for today for Doha - 4:58 AM, 6:20 AM, 11:40 AM, 2:40 PM, 5:00 PM, 6:30 PM. There is supposed to be a preliminary call to muster folks for prayer, then one to tell them to line up for said prayer. I am not sure if the former comes even earlier. I just know that it is a lot of praying and a lot of some guy saying stuff on a loudspeaker that you hear whether you want to or not. 10. The gym is worse than I thought. It turns out that the free weights are the cheap ones from Technogym. The handles as skinny, slick, and they rotate. On the plus side, they may build up my forearms even more, which I did not need. On the negative side, sometime in my near future, I may accidentally launch a free weight across the room into someone or something. A couple of colleagues and I went to the Irish Harp, the Irish pub in the basement of the Sheraton hotel. This time around, they gave us some crap about buying a 60 QAR (~$17) membership. The cost was not a big deal, but the annoyance was, so as we were calling our friends to tell them we would rather go somewhere else, they decided to let us in without it...this time. Not sure it's worth the hassle to come back, as I am not going to carry around a wallet full of bar memberships. OK, so we get in there and I decide to roll the dice and get some food, as this is the place that gave me food poisoning during my first week in Doha. I had the steak and kidney pie. 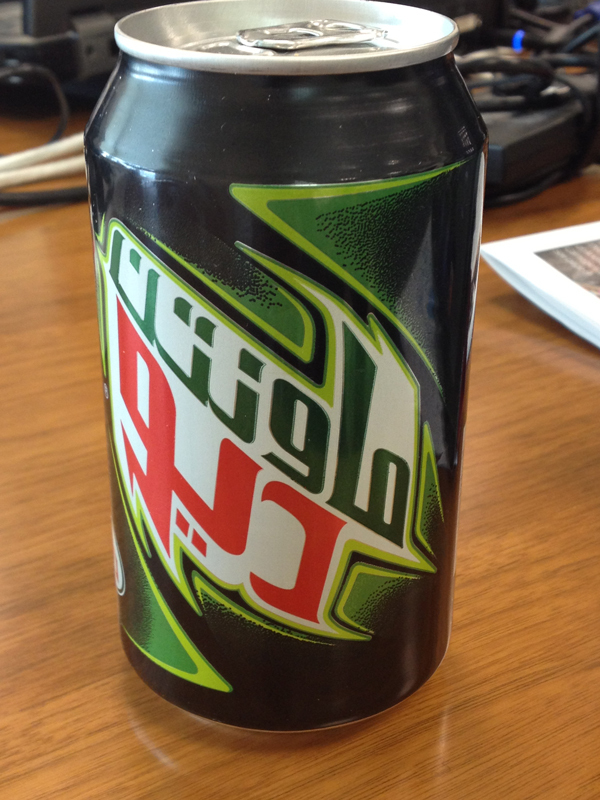 It was not bad. I made a mistake and ordered Guinness, my least favorite beer, and this killed my desire to drink anymore. That, and the possibility that I would be called later to meet some ladies...or perhaps I would get food poisoning again and I'd rather be well hydrated if that happened. So, I stuck with water for the rest of the evening. [Day 69] Friday, January 8th, Minoryx! 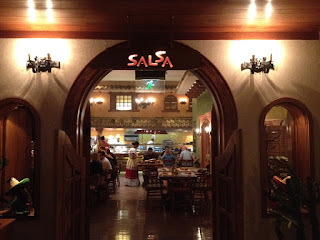 Salsa! I started the day out with another run. 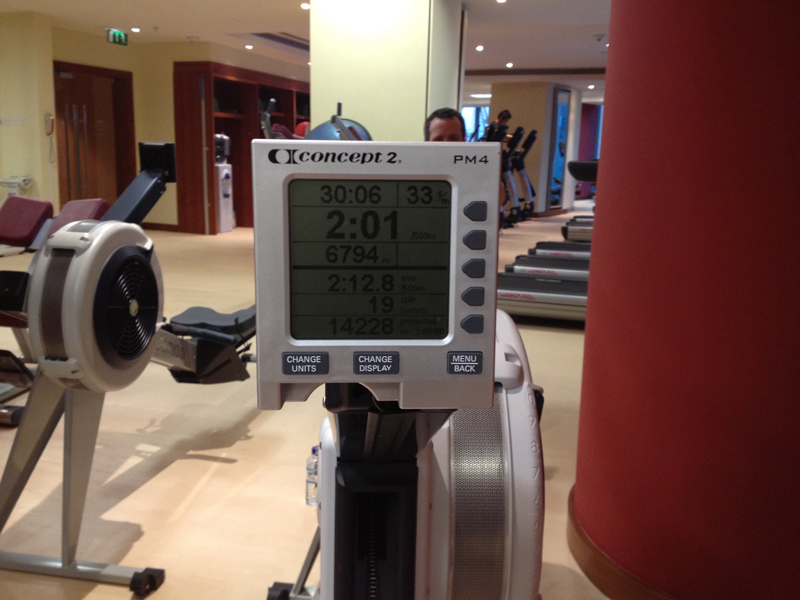 I was determined to cut at least 30 seconds off my average pace and I was well on my way. 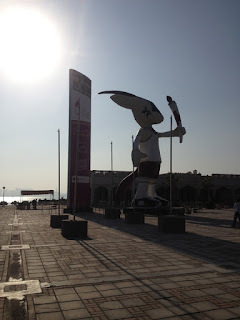 I ran from the Al Rabban down to the Corniche and then along the Corniche to what I call "the Minoryx" - a freakish half man, half oryx mascot of some games (the past Asian Games or the future Olympic bid? Not sure). Then I realized that I had paused RunKeeper while trying to modify the audio cues...while running...so much for that route record. Sigh. Next time! 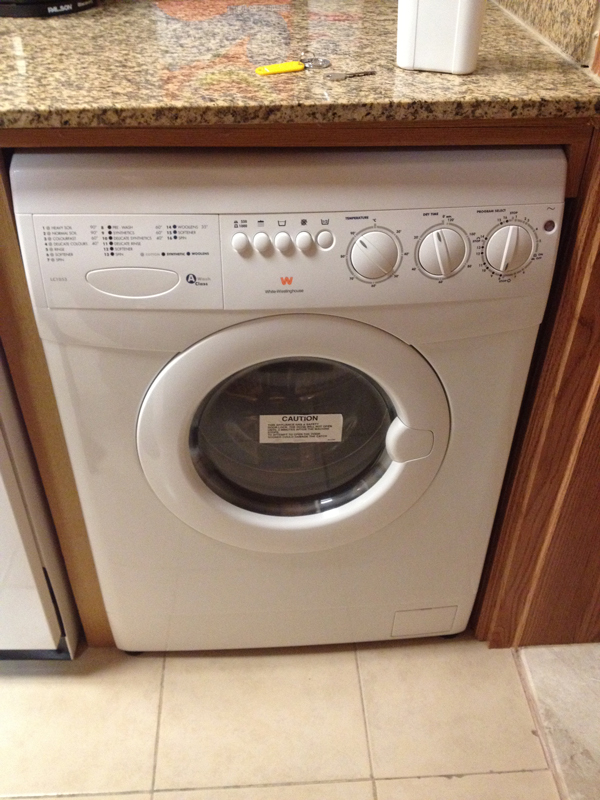 My clothes still go unwashed as I have not yet received a manual for the demonic washing beast in my kitchen. THREE containers for detergent and stuff! So many dials and pictographs! Ahhhh! I will defeat you, demon...as soon as I have a manual. 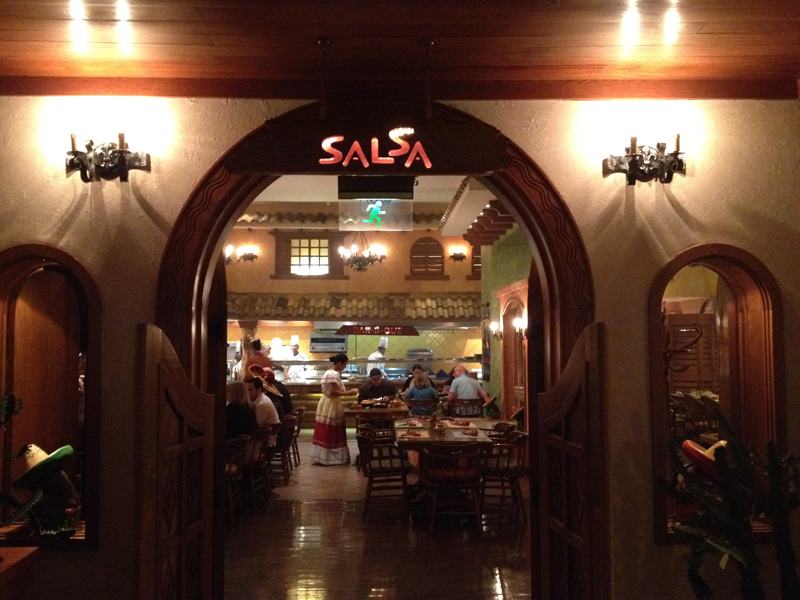 Well, in my quest to exhaust all Tex Mex options here, I dragged some friends out to the (old) Marriott (near the airport) to go to Salsa, a self-described Mexican restaurant. 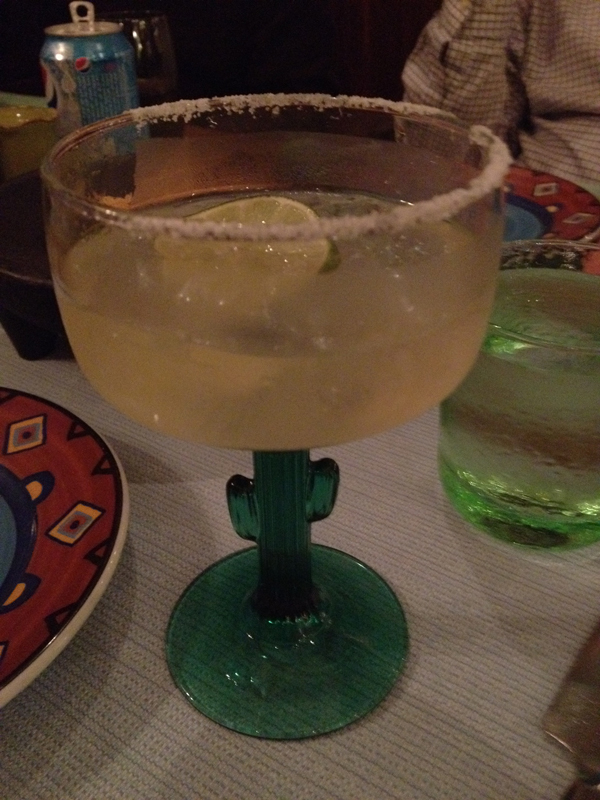 I started out by ordering "the perfect margarita". It did not taste perfect, and, like most hotel drinks was absurdly expensive, (~$20). However, I have to hand it to them on potency - I felt that margarita more than any margarita I have had in the USA. 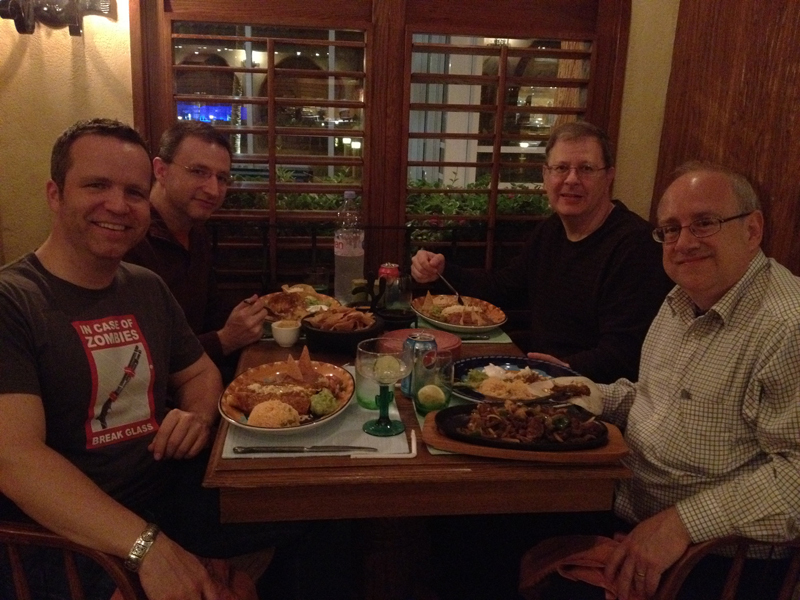 We all ordered canonical food, chile con queso (appetizer), burritos, enchiladas, and fajitas. 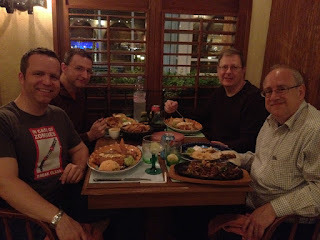 The food was not bad, but the general consensus was twofold - 1) fajitas are the smartest choice, because it's hard to mess up grilling some meat and 2) Salsa was probably not worth a return visit in terms of their food. 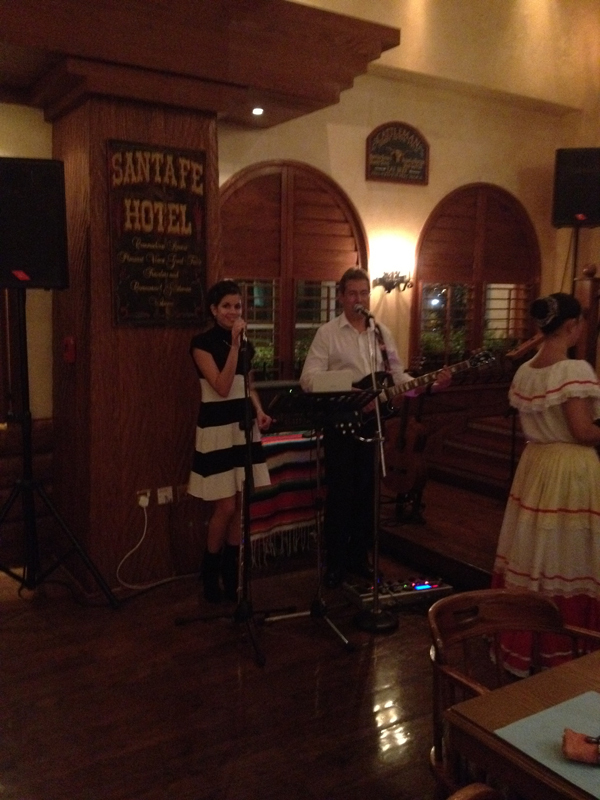 They had a live band, which was interesting. About half or more of the songs were just random songs. It was not significantly Mexican/Tejano-themed music, especially the instrumental flute and guitar rendition of Genesis (I can't remember the song now). However, I give them props for 50% of the band being very cute and dancing well. Hint: it's the half that is smiling. After diner, my Xbox forced Eric to play Gears of War for hours. The poor guy...so abused. A few weeks ago, a lady friend suggested tequila shots and I, a Texan, had to admit, with embarrassment, that I neglected to pick up tequila when I went to QDC. Well, today I was able to wash away the shame and correct that. 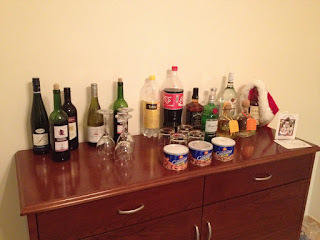 I also filled out my BEvERage selection for guests. You see...currently, beer is my last choice for alcoholic beverage; I don't dislike it, I just prefer liquors, mixed drinks, and wine. But many of my colleagues like a beer, so I picked up a dozen light (Stella Artois) and a dozen dark (Franziskaner Weissbier). 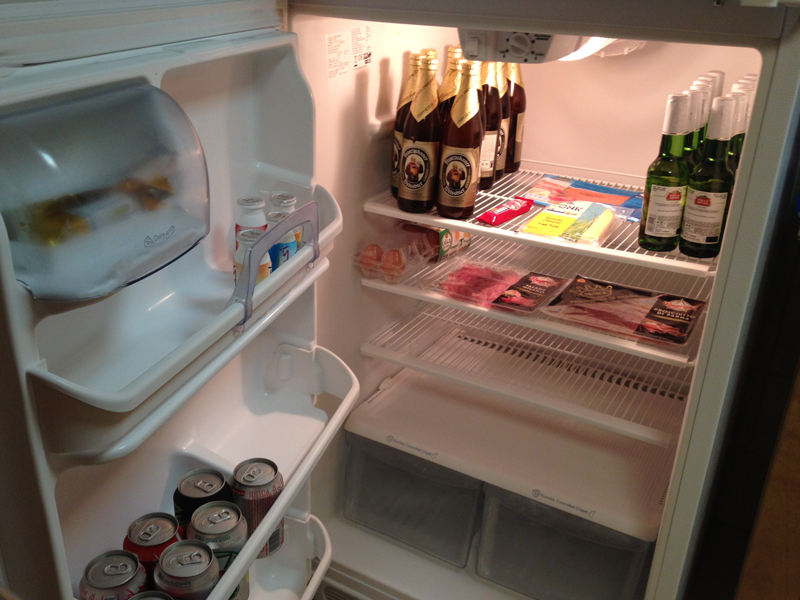 Now, my refrigerator has a serious bachelor look to it. You'll be relieved to know that I finally had a chance to correct my error of omission and pick up some Patron tequila and Jack Daniels whiskey. now I have all of the usual suspects for common mixed drinks. And the cashews, pistachios, and almonds make it healthy, right?